One of the joys of living on the west coast is the abundance of fresh seafood. 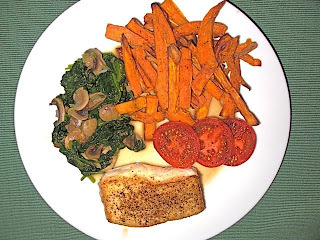 This is a favorite meal of ours: Halibut, pan seared and oven roasted until just done, with a white wine reduction; oven roasted sweet potato fries; fresh spinach, sauteed with mushrooms and green onions; and campari tomatoes, salt and peppered and drizzled lightly with olive oil and balsamic vinegar. Healthy and delicious! What's really amazing is I get this at HOME! That looks like the perfect most well rounded meal! A great pre-marathon meal if you get my hint! :-) With a nice glass of wine, that would definitely be featured in any health magazine!